Training sessions should not be spent untangling a ladder. The Quick Ladder Pro employs the concertina, or accordion, fold for tangle-free setup and breakdown. No webbing means no tangling; no tangling means no training time lost. Inspired by the concertina, or accordion, fold of Chinese fans, the Quick Ladder Pro keeps things efficient during training sessions. Rigid, hinged sides and overall durable construction make for easy folding and unfolding. Simply put, it's the ladder to replace all ladders. A truly tangle-free training ladder is here. Inspired by the artful zigzag fold of Chinese fans, the Quick Ladder Pro is designed without webbing and with hinged side rails for rapid-fire unfolding, folding and storage. No matter the drill, the low-profile soft edges limit cleats from catching. 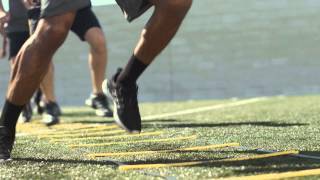 With extensible ends and sides, the Quick Ladder Pro lets you add more ladders to up the variety and increase the length of your key agility and speed drills.